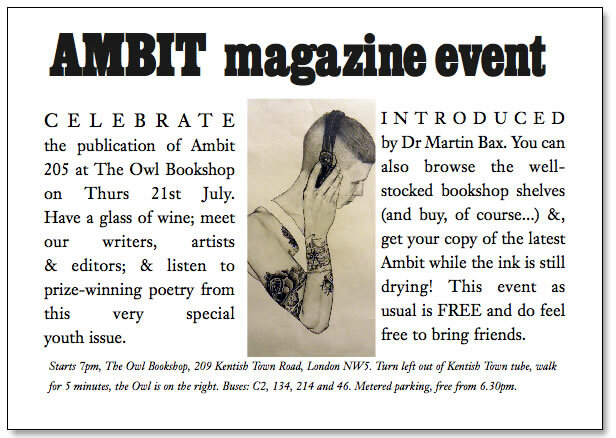 Ambit journal has been making bookshelves look better since 1959, its Highgate offices delivering a busy smelter of poems, short stories, reviews and artwork on a quarterly basis each year. July 2011 saw the launch of their first ‘Youth Issue’ – much of the contents was produced by those under the age of 35 and features work by Sam Riviere, Liz Berry and Edward Mackay. My short story ‘Of Seeping and Draining’ crept in there too – it was great to meet and read alongside many other contributors at the issue’s launch in Kentish Town. Many thanks to the Ambit team for the opportunity and for curating such a tasty-looking journal, as well as to the Owl Bookshop for the venuehood. Thanks also to artist Mireille Fauchon, whose commissioned drawing accompanied my piece.